AEGIS provides certificated Continuing Professional Development (CPD) opportunities for security professionals that can be completed entirely online (e-learning) at a time and place that is convenient to you. 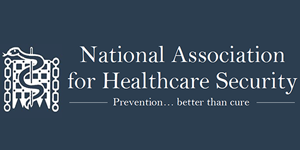 The National Association for Healthcare Security (NAHS) was formed in 1994, as a non profit making professional organisation in the United Kingdom. The NAHS works to continually improve security in healthcare facilities through training and the exchange of information and experiences. The Security Institute is the UK’s largest professional membership body for security professionals and is committed to raising standards within the security profession. The Security Institute encourages everyone working in security to actively seek to develop their knowledge, competence and expertise. The Security Institute's CPD scheme gives participants a competitive edge over other practitioners, enhancing confidence and competence. Superb courses, informative, nicely set out and easy to use. I have been a Security officer for 10 years now and still managed to gain extra knowledge and confidence from their content. Thank you so much. You will then be provided with Log-In details to access the e-learning course content. You then have up to three months to complete the course and qualify. Reading and assimilating the training content for each course should take about an hour. When you are ready, you can take the Online Exam. This consists of 16 Questions (multiple-choice). The Exam is time limited to 35 minutes. You need to answer at least 12 questions correctly to pass (75%). As soon as you qualify, you can download a personalised certificate, endorsed by the National Association for Healthcare Security (NAHS) and recognised by the Security Institute to the value of the CPD Points shown. If you don’t pass first time, don’t worry. You can take the Exam up to three times before you have to apply again. This Certificated Security CPD e-learning course informs about the nature and extent of self-harming in the UK, identifies vulnerable groups; develops understanding of why people may self-harm and common methods used. It also introduces the concept of a ‘harm minimisation’ approach and provides guidance on how best to support people who have self-harmed or are considered ‘at risk’ of doing so. Security Officers are not expected to be able to diagnose specific mental ill health or learning disabilities. However, it is most important that they can recognise signs of a person’s potential vulnerability (i.e. arising from their medical condition) as it will both inform and direct their approach and dealings with them. This Certificated Security CPD e-learning course provides a valuable insight into the characteristic signs, traits and symptoms of people who have mental ill health and learning difficulties. ‘Challenging Behaviour’ is any non-verbal, verbal or physical behaviour (including non-compliance) by service users which makes it difficult for staff to perform clinical tasks and/or poses a safety risk. Challenging Behaviour can range from mildly uncooperative to highly disruptive and dangerous conduct. This Certificated Security CPD e-learning course explains why Challenging Behaviour occurs and how best to prevent it happening.